In the first half of the 20th century other galaxies were recognized, their red shift measured and theories of the whole universe were developed. They included Big Bang and Steady State. Arno Penzias and I found the Cosmic Microwave Radiation (CMB) in 1964 and it was interpreted as thermal radiation left over from a hot big bang, ruling out other theories. 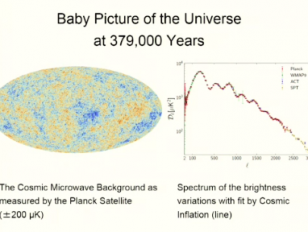 In the 50 years since then, observations have improved so that the CMB gives a detailed picture of the universe at the age of about 380,000 years. That combined with the 3D distribution of galaxies gives high confidence in the standard model of the universe. The Big Bang must have been started in a very specific way and Cosmic Inflation is thought to explain how that happened. More evidence supporting Inflation may soon be available from the CMB.